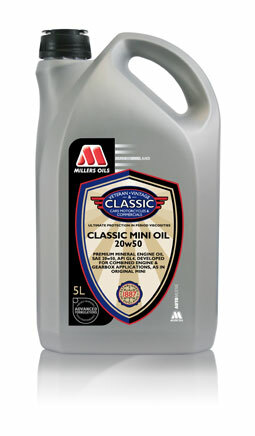 Millers Oils Classic Mini oil is formulated for engines from 1960 onwards where engine and transmission share a common lubricant. Ideal for Minis and motorcycles where the clutch runs in engine oil. The additive package protects ball, roller and needle bearings found in the gearbox and provides EP protection levels higher than conventional engine oil and equal to API GL5 for gearboxes. Customers report much quieter transmissions when using this oil. This product is probably unique to Millers Oils. Also available in 1 litre.